Ever felt a reassuring hand on your shoulder, heard your name whispered, or experienced a deep sense of love and warmth, only to turn around and see no one? That’s unmistakably the sign that an angel is nearby. Our protective angels let us know they are there… if we take the time to look. Our angelic guardians, who see all the things we do not, want us to notice the beauty around us! Take a moment away from work, put away the electronic devices, and really observe…there is so much you probably never saw before. One of the first and most obvious places to look is the skies. Clouds, to be specific. Finding shapes like wings, hearts, or halos in the otherwise random cloud formations is a sure sign of angelic presence. Animal shapes might appear too – some angels walk on four legs! We also associate angels with their wings. Feathers found unexpectedly are a telling sign. Look for the small, white, downy kind in unexpected places. 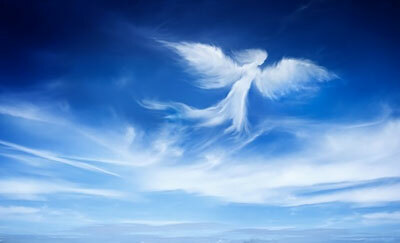 Speaking of unexpected, anything that seems unusual or ‘out of place’ in nature can be a message from your angel. Animals with distinctive markings, patterns in frost or sand, plants that seem to form shapes, or a rainbow on a dry day, are all associated with the presence of angels. There’s also those unexpected taps on the shoulder, phantom embraces, and gently breezes. It’s not just a coincidence; it’s your personal angel looking out for you. As adults, we sometimes lose our ability to see our angels firsthand. However, very young children and our pets often do. If they’re reacting to something that doesn’t seem to be there, an angel may be in the room. Same thing goes for animals outdoors; their senses tend to be much sharper than ours. Most significantly, the blessings we receive are given to us by our angels. We’ve all had those times in our lives when we most needed money, companionship, a promotion at work, or a lost object. Isn’t it funny how, when things look the most bleak, it all turns out all right in the end? The truth is, angels have our well-being as their mission. When we start to despair and worry, it’s important to look all around for their assistance. They want to know our struggles and our problems so they can know how to best help us. It’s easy to become distracted by all the incoming stimuli of our world and forget that these heavenly messengers are all around us at all times of the day. If you’re having doubts, ask your angels to make themselves known. The more we come to know them, the easier it will be to see them in all things. The whisper of a breeze, the delicate petals of the flowers in your garden, or the lyrics of a long-forgotten favorite song. They stop being random and start being insights into the power of angels to change your life. Listen, learn, and experience them in their glory.